Would you ever give up your F20 engine for a K24? Read one owner's reasons. Most people don't purchase their first S2000 with the intention to tear the F20 powerplant out, and neither did Kevin Nguyen. In fact, he had no intention of buying anything, least of all a drop top, when he walked into a Lexus dealership in Colorado one cold February day in 2007. An open mind is a dangerous thing though, and when Kevin walked out he was holding the keys to his very own 2003 S2000. Never underestimate the power of an open mind, a spots car, and, possibly, a skilled automotive sales associate. 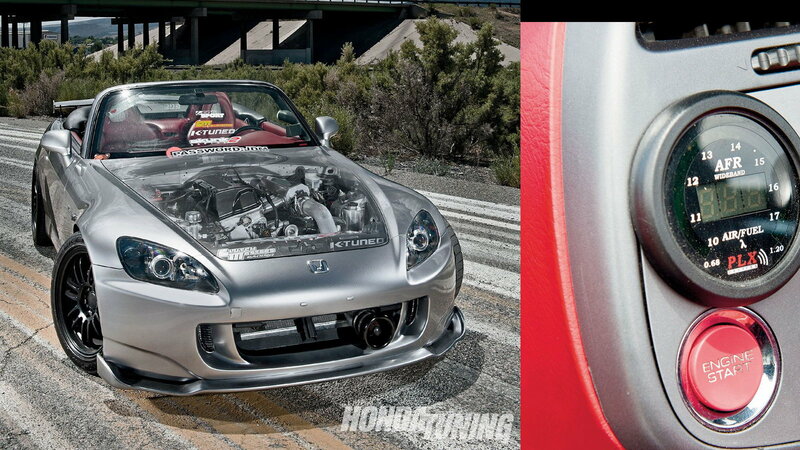 >>Join the conversation on Kevin's K24 Swapped S2000 right here in S2Ki.com. Like every dutiful S2000 owner before him, Kevin made his way down the upgrade highway, starting with coilovers, new wheels, a cage, and enough Mugen parts to choke a horse. "I started feeling like I was almost done," he remembers, "until around March of '09. That's when I started tracking the car." And with that, a new driving force took over: lap times. "I sold off some of my good looking parts in order to pick up a few go-fast parts," Kevin shared. Those parts included a Hondata K-Pro ECU, an intake, exhaust, and new, non-staggered wheels. His times were improving but not as much as he had hoped. Kevin began looking around for answers, again with an open mind. He often went to track days with his Integra-driving buddies, and they started comparing notes. Comparing his F20 dyno curves to his pal's K20a3 graphs pointed out a marked midrange power advantage—in the K-motors favor. As people have discovered before, Honda engineers maxed the potential of the F20 out so far that it's not an easy task to improve on it without resorting to forced induction. In contrast, K series engines seem to respond exceptionally well to even simple upgrades. Kevin put two and two together and came up with a new plan, he'd find a way to fit a K24 into the engine bay of his S2000. This was eight years ago when such a swap seemed radical and more than just a little bit scandalous. Reaction on the forums was mixed, and at the time there weren't any aftermarket kits to help him achieve his goal. Remember, this was in 2009, and the hammer that hit the world economy fell on Kevin too as he lost his job. "I realized that for the time being, working on cars would keep me sane," he recalled. He called his track day pals up and they hatched a plan to attack the swap. After crunching the numbers it seemed even more feasible, and on Thanksgiving of 2009 they put Kevin's S2000 in the air and went to work. They started with the biggest hurdle first—adapting the K24 to the stock transmission. Kevin, an architect by trade, turned to his computer, drew up an adapter plate and sent the design out to be CNCed. 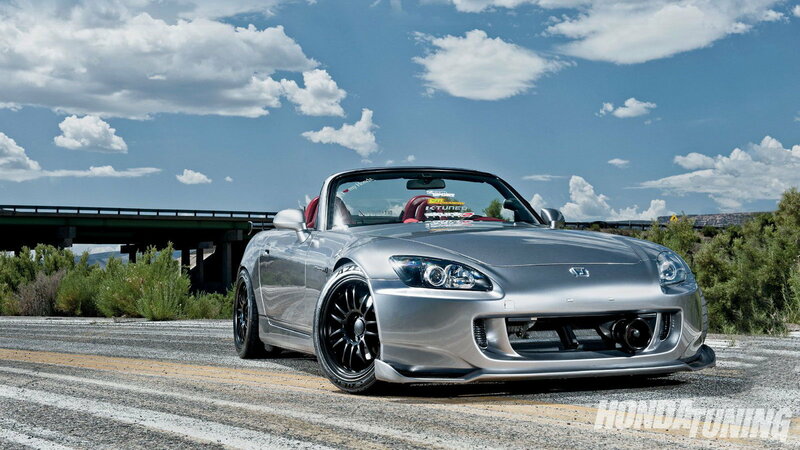 "I was able to get $1,500 for my old stuff, netting me enough money to get a set of Innovative S2000 mounts, a K24A1, and have the adapter plate properly cut. I got the adapter plate from the machinist and tried to bolt it to my S2k transmission and the K24. The thing actually lined up, which was a huge relief!" Getting the engine and trans to bolt up was only part of the picture though, they still needed a way to transmit the power. At the time no clutch/flywheel options existed for the swap. "The flywheel I designed in Solidworks was going to be too expensive to make. I contacted ClutchMasters, and they made me a custom flywheel and provided their stage IV clutch that was able to hold the power," he relievedly recalled. With that issue solved, they turned their attention to the throttle body location. On their K-motor it was mounted on the driver's side, and with the engine mounted longitudinally in the S2000 it would end up against the firewall. At first, Kevin thought to modify a TSX intake, but after speaking with specialists at K-tuned he realized a custom manifold from Magnus Motorsports was available that would fit the bill. After that, it was smooth sailing for the S2000 and Kevin. They test fit the engine again, fabricating a custom wiring harness in the process. Success. The engine ran and the trans shifted. This being a track car, don't forget, the engine came out and went to a speed shop. After being fitted with a fresh set of Skunk2 cams, 12.5:1 CP pistons, and Eagle rods, Kevin, and crew adapted the fuel delivery system using K-tuned pieces. The result? Kevin was a happy man, as happy as anybody searching for ever-lower track times can be. As Kevin tells it, "I got my chance to see the new numbers a few weeks later on the dyno. I gained 50 horsepower and 50 ft-lbs of torque, as well as a lot of area under the curve. This first dyno was a good baseline, but we know there is a lot more power to be had later on by taking advantage of iVTEC and getting a better header." Never underestimate what an open mind can accomplish, and what a group of friends can do in a garage if they set their minds to it.